This Friday, February 3, CES Cru will be celebrating their official signing to Strange Music with an explosive live show in their hometown of Kansas City. As the lyrical duo continues to impress listeners around the world, the web seems to be buzzing about their music and official signing party. If that wasn’t enough, it appears as though both Brotha Lynch Hung and Strange Music MVP Awards Producer Of The Year Jomeezius The Genius are looking to work with the Kansas City team. What else can fans expect from CES Cru? 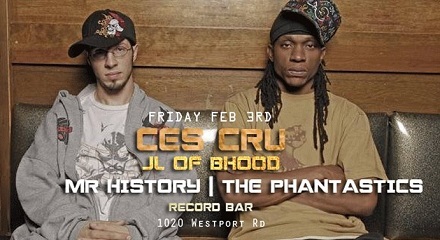 Stay tuned and be sure to check out CES Cru live THIS FRIDAY at Record Bar! How do you feel about CES Cru working with Brotha Lynch Hung and Jomeezius The Genius? Will you be attending their signing party?